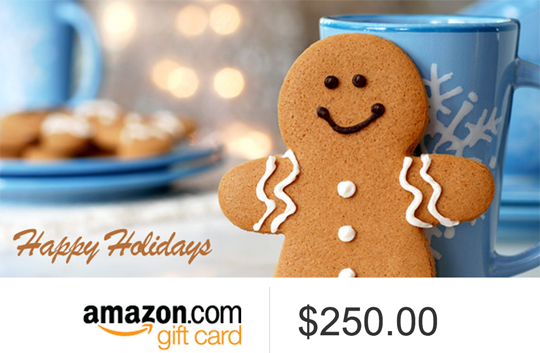 It’s time for our Fifth Annual $250 Amazon.com giveaway! 2016 has been a rough year for…well, just about everybody on the planet. Over the last few weeks, I’ve been trying to focus on the good things in our life, and one of the best things is all of you. We’re so thankful for all of the love and support you give us by reading, commenting, emailing, and keeping our family in your thoughts and prayers. It’s been an emotional 12 months between losing Rigby, the birth of sweet baby Liam, the hard but rewarding work of Friends of Maddie, and being the March of Dimes family ambassadors, but the highs were higher and the lows were softer thanks to all of you. To thank you for the love you always show us, we’re giving one lucky reader a gift card to Amazon.com. We don’t take any of you in “internet land” for granted, and we wish we could give all of you $250! This giveaway is open to every person on planet Earth who reads this blog and follows the directions on how to enter. Sorry, illiterate space aliens! Enter by leaving a comment. You may leave one comment per day until the contest ends at 5pm PST on Tuesday, December 20th, 2016 . You can also get a bonus entry by liking The Spohrs Are Multiplying’s Facebook page – just leave another comment saying you liked (or previously liked) the page. Winner will be chosen by Random.org. Prize will be delivered via emailed gift certificate to Amazon.com (if Amazon isn’t available in the country of the winner, we’ll work something out). If winner lives outside of the US, prize will equal $250 US Dollars (sorry, countries with a stronger currency). This post is 100% sponsored by the Spohrs. Congrats to Lexi!!! Look for an email from me! Book Party Hip Hip Hooray! Thank you for the opportunity. Merry Christmas to all. And I liked your Facebook page FTW! Merry Christmas to the Spohr family! May your days be Merry and Bright! Happy holidays – thanks for blogging! I continue to be amazed and inspired by you and your family. Thank you for sharing yourselves. Merry Christmas! Thanks for sharing with us all. I also just liked your FB page! I (previously!) liked your FB page. Happy Holidays! Thanks for continuing to share your stories! Merry merry! I already liked the FB page. I love your blog and check in almost every weekday to see if you have a new post. You have a lovely family. Happy Holidays! And happy holidays– that’s a beautiful tree! I also have already “liked” your Facebook page. Happy Christmas to you and yours! Beautiful tree! Merry Christmas Spohr Family! I enjoy your blog immensely! Merry Christmas and thanks for sharing with us throughout the year! Previously liked your FB page! Merry Christmas to your beautiful family! Merry Christmas! Also liked your Facebook page. Yes, 2016 has been a rough year, for far too many people. Merry Christmas to you all. 2016 was THE WORST (I lost my father in August), so here’s to a great 2017! Love your blog Spohrs! Love watching the kids grow up. Also follow y’all on facebook! Love me a contest and a great blog. Love it! Just recently found your blog. Can’t wait to read it every time you post. Merry Christmas!!!! Have already liked your Facebook account – you guys are the greatest thanks for your NICU tips post,, I passed it in to a friend. Yay! Not an illiterate space alien! Happy holidays!! Hope it’s wonderful! I also already like your page on Facebook. Merry Christmas to you and your family – I love coming to your page each morning, a habit of mine for many years. Merry Christmas to you all! It really is kind of you to offer this up every year. Your blog is one of my favorite parts of my morning routine! Merry Christmas! Oh! And I’ve already liked your Facebook page, too. It’s either through there or Bloglovin’ that I’m notified of your posts. Simply having a wonderful Chriatmastime! Hope you and yours are too! Such a generous gift. Thank you Spohrs! Also, I’ve liked you on facebook for quite some time now! Best wishes to you and your family for a wonderful holiday season. Your blog is one of my favorites and I so enjoy being able to read your updates each week. I liked the FB page! Merry Christmas to you and your beautiful family!! love reading about your family! Here’s hoping 2017 is a much kinder, gentler year! I so enjoy reading your blog everyday. My children are in college so I miss the younger years. Thanks for allowing me to live through it again! Happy Holidays! Here’s to a better 2017 for all! Your blog is part of my morning routine. I read three blogs every morning while I eat breakfast and your is one of them. Merry Christmas! ? I liked your FB page! ? I love starting my day by reading about your family! Merry Christmas, have a great winter break with your kiddos. Thanks for the chance and Merry Christmas! I previously liked your FB page too! Merry Christmas! And thank you for writing. I’ve been reading you every day for years and love seeing your photos each morning. Love following your life adventures! Thanks for making the year more bearable!!! Happy holidays and thank you for the wonderful daily reads, insights and fun! You guys are amazing! Thank you for everything you do. Yay, Amazon ?Thanks for the opportunity to enter. Merry Christmas ? Thank you for sharing your life with us. Merry Christmas! Happy Holidays! Thank you for sharing your lives with us! I’ve also liked your facebook page. Have previously liked (and follow) your facebook page! Also Merry Christmas! Happy Holidays to you and your family! Thank you for being so generous to your readers! Merry Christmas! May 2017 be brighter for all. Merry Christmas! Wishing you all the best in 2017!!! Merry Christmas, and thank you for offering this again! I also liked your Facebook page. Thanks for doing this giveaway! Thank you for offering this! Merry Christmas! Also, I’ve liked the Facebook page! Thank you for sharing your life with us. Happy Holidays Spohr Family! Thanks for making my days a little brighter through reading your blog! I liked the Facebook page a loooooong time ago, but I still like it! Hope you have a wonderful and very happy Christmas! Merry Christmas! Thanks for all you do! You’re awesome, Spohr family! Merry Christmas! And I “liked” your FB page a long time ago! I previously liked–and still like–your Facebook page. I check your blog every morning. It is a wonderful part of my morning routine. ? Thank you and Happy Holiday and Merry Christmas! I also “liked” your FB page. Didn’t know you had one. Happy Holidays! Thank you for entertaining me these last few years. Well, maybe 7 or so. I can’t believe it’s been that long. Happy Holidays! I’m trying to focus on the positive, too. Here’s to 2017! I had already liked your facebook page! And Happy Holidays! I have liked your fb page forever! Merry Christmas. I’ve already liked your fb page. Heather, thanks for the laughs. Merry Christmas Spohrs! Merry Christmas! 2016 was awful, hoping for a happy holiday season to end it on a good note, and better things to come in 2017. I previously liked your FB page! Wishing you peace, love, health and happiness in 2017! Merry Christmas to the Spohr family! I liked and follow your Facebook page! Happy Holidays. Love reading your blog. I have also liked your Facebook page. I liked your FB page too! What a nice gesture! I like you on FB, too. Happy Holidays! Merry Christmas! Stumbled upon your blog when Maddie was born and have been following ever since! Merry Christmas to you all! I like your blog, I liked your FB page months ago, and I’m pretty positive I’d like all of you in real life, too. What a great giveaway. Following your sweet family is a gift too! Happy Holidays! I’ve previously liked your Facebook page. Thank you, and Merry Christmas! I love coming here to read y’alls posts and seeing pictures of your family’s life! Keep up the good work!! Greetings and a merry Christmas from Germany!! I love reading your blog! I hope you and yours have a great holiday. Merry Christmas and thanks for your generosity! Bonus: And I’ve “liked” the FB page for quite some time. What a generous thing for your family to do! As a daily reader here and on Facebook, I thank you! I love reading your blog, while drinking my morning coffee and eating breakfast. I love following your family. Even if I feel like a creeper. Merry Christmas!! Awww.. thanks Spohr’s! I love this blog and have been reading for years. I’ve been a “liker” of the FB page for years as well! I also like you on Facebook ? I recently told my friends who have a preemie still in the hospital (and lost her older sister) about your blog. I hope they get as much from it as I do. I’ve read the blog every day for years from afar in Ohio. I also am a follower of your Facebook page! And also a “liker” already! And i already “like” your Facebook page! Merry Christmas! What a nice gift for one of your readers to win (hope it’s me, haha). Merry Christmas Sphors, here’s hoping 2017 is easier on all of us! I liked your Facebook page months ago! Writing another comment because I’ve previously liked “The Spohrs are Multiplying” on Facebook, for my extra entry. Also a “liker” already too! Yay!! And Merry Christmas, Spohr’s!! And I liked your Facebook page years ago! It’s so generous of you to do this every year without fail. I also liked your Facebook page ages ago! Would love to win! Merry Christmas, Spohr family! Love your blog! Merry Christmas! I’ve been a long time follower on your Facebook page. I have previously liked your FB page. Happy Holidays to the Spohr family. You guys are amazing and so generous. I have always liked your Facebook page! Merry Christmas to the Spohrs! What a sweet gift! Happy Holidays to your family. I’ve liked your FB page for a long time now ? You guys are so awesome!! Merry Christmas! I have also previously liked your FB page. I liked your page forever ago! This is so awesome that you do this! I liked your FB page a while ago! Merry Christmas to your whole family! Merry Christmas, Spohrs! May 2017 be a better year for many of us, in many ways. Keep the words and pictures coming! Merry Christmas & Happy 2017!! I’m a FB liker, too. I also liked your Facebook page. I didn’5 realize there was one for your blog. This is amazing, and thank you! Merry Christmas!! I am a FB liker as well! This is so sweet of your family! Merry Christmas! I like you FB page. I also liked your Facebook page! Happy holidays and thank you for the giveaway! At least 2017 can only be better (Right? right?….right?)! Have read since the early days. Love your family. I also already follow you on Facebook! ? And of course, I’ve liked your Facebook page for years! Merry Christmas! I also like you on Facebook. Happy Holidays and here’s hoping to a brighter year ahead in 2017! I’ve previously liked your FB page! It has been a rough year, but I am always grateful for you and for the posts you share. I have previously “liked” your Facebook page. Have a wonderful holiday, Spohrs! Love the blog – Merry Christmas! I’ve been a reader of yours for years and especially enjoy the Sunday Surfing links. It’s how I often end my weekend so thanks! Merry Christmas! Oops. I forgot to also say that I “liked” your FB page. Thank you for your generosity! Merry Christmas! ???? Merry Christmas and have a wonderful new year!! Merry Christmas! Your blog is always a bright spot in my day. I LIKED your FB page!! Merry Christmas! What a nice gift. Merry Christmas! and I liked your FB page! Merry Christmas. I love your blog! Merry Christmas to you and your lovely family! Liked your FB page a long time ago! Still love reading your blog, many years later! I have previously liked your page! My first post didn’t load…. but Merry Christmas!!! Also I have already liked your Facebook page! I like the Facebook page! Also, I’ve liked the Facebook page! I already liked the Facebook page! I have already liked your fb page. ? May 2017 surpass the world’s very low expectations. And, in the meantime, have a wonderful holiday season. You guys are so generous! Merry Christmas and I wish you all the happiest 2017! I previously liked the Facebook page! Merry Christmas, Spohrs! Thanks for writing every day, Heather, and letting us into your world. Thanks for the sweet giveaway! Happy Holidays! I previously liked your Facebook page! Yay thank you for doing this again! I love your blog!! Thank you for sharing with us! Thank you for sharing your family and experiences with us! Merry Christmas! Thank you for sharing your family with us! Merry Christmas! And I liked the FB page also… forgot to mention that in the first post! Merry Christmas! Your tree is beautiful! You’ve nailed that bokeh! Merry Christmas to all of you! Thank you for sharing your family with us. 2016 and I are seriously headed for a bad break-up! I’m totally over this year and I never say that! Thanks for sharing your life with all of us. Happy Holidays and here’s to an amazing 2017!!! Merry Christmas! Also liked your FB page! Happy Holidays! I love reading your blog. I hope 2017 is a better year for all! I liked your FB page! Merry Christmas ??? Merry Christmas! It wouldn’t be trip to Target without my girls pointing out Jamsie’s picture on the diapers. Thank you for sharing your family with us. Merry Christmas Spohrs! May your days be merry and bright! and I have previously liked your FB page. Super Merry Christmas to you! And I liked your FB too! You all are so amazing! Merry Christmas, and thank you for sharing your family with us. And I liked your Facebook page. ? I also like your facebook page! I also liked your FB page. Also I have been on your facebook page for ages! I think this is the nicest thing!! Merry Christmas! Love you guys! Merry Christmas! Already liked your Facebook page! I liked your Facebook page ??? You are so kind! I love following your story! Annie and James are so cute. Going on several years of having liked your facebook page. Yay! I love Amazon and I love reading your blog! Here’s my comment to enter! I always look forward to your posts. Merry Christmas to you, too! Love your entire family! Also, I already like your facebook page! That’s how I saw this post. Delurking to ask you to pick me! Love your blog! Your family brightens my day and I definitely appreciate your writing and sharing your family and adventures with us! Oh and having you on my facebook is great too Happy holidays! I love your blog and your family – Merry Christmas! This is so amazing. Merry Christmas! Merry Christmas! Can’t wait for 2017 and better things! I’ve “liked” your Facebook page for quite a while now! Love reading about your sweet family and your Surfing Sunday posts are always full of great info! Thank you, Spohr family! Thank you for this opportunity and Merry Christmas! Liked your page on Facebook too! Long time reader. I have learned so much from reading your blog. Thanks! Liked the FB page too. Merry Christmas to the whole Spohr family! I previously liked your page on fb. Count me in! With another little one coming in the spring, I can think of a thousand things we could use $250 for. Thanks so much! Also, I’m a Facebook fan! I’ve read your blog for years, and I look forward to your posts! I’m also a follower on FB. I’m also a FB fan. Happy Holidays, everyone! Here’s hoping for a great 2017. Been a FB fan for a while now. Oh, and I liked your Facebook page! Merry Christmas beautiful Spohr family. I’ve liked your facebook page for a long time. You are so kind. Merry Christmas. Oh I have long since liked your Facebook page! Happy Holidays! I didn’t know you had a facebook page…I liked it and look forward to seeing the posts. I liked your facebook page! Awesome page by the way! Already liked the page too. ? I “liked” your FB previously! Yay! You guys are the best. Also – I’ve liked your Facebook page for a while! Happy Holidays! And thanks for sharing your family with us! I follow/like your FB page. Merry Christmas! Enjoy a warm CA Christmas! Merry Christmas! Thank you for sharing your stories with us – I just love your family and have been following you for years! ? I also follow/previously liked your FB page. ? Thank you, Heather, for all that you share with us. Sending you and your family love and wishing you a Merry Christmas and and even merrier New Year. Thank you for all your lovely posts – the happy ones and sad. My younger daughter (six) thinks Annie is cool and very cute. High praise indeed! I love you! I have always liked your facebook page. I liked your facebook page a long time ago. Merry Christmas, liked your page ages ago! I have liked your Facebook page.? Thank you so much for opening your home and family to all of us every day. Happy holidays Spohrs! And pshhhh – I liked your Facebook page years ago! So generous of you to do this every year! Love your blog and think you’re amazing! Also, I liked your FB page today, so I hope that gets me a second entry! I love your blog AND I liked your Facebook page! I like you on Facebook too! Love your site and love your family! Already liked you on FB, since it’s easier for me to access the page from there (phone browsing, my laptop always besieged by cats and/or kids). Thank you so much Spohrs Family! I love reading your blog, and I wish you could give each of us $250, too! Funny how the number of comments climbs when there’s a giveaway, huh? So generous! Merry Christmas to your family! Just liked your FB page ? Oooh, And I liked your page too. Merry Christmas and I hope next year brings you the best!!!!! Merry Christmas! I love reading your blog. I like your Facebook! Happy Holidays! Thank you for the smiles, laughs, and shared tears. I have been following you on Facebook for quite a while! Merry Christmas! Your blog is the only blog I must read every day. Thank you for taking us all along on your journey. ?? Thank you for sharing your lives! My twins are turning one tomorrow (12/16), 2016 was an exhausting, whirlwind of a year! I enjoy checking in regularly. Merry Christmas! This is very generous of you. Wishing you a happy holiday! Thank you for sharing your life with us! Oooh, an awesome giveaway! Thank you! Thanks for my daily dose of fun! Enjoy the holidays. Merry Christmas to your beautiful family. Happy holidays and thank you for the opportunity! And I liked the Facebook page and will be genuinely glad for some new content in my feed ? Thank you for the laughs and smiles your writing brings throughout the year. Merry Christmas! What a year! Thank you for giving back. Would love to use this on my foster daughters! I can’t believe I have been coming to this blog for some many years. You were pregnant with Annabelle when I started reading! Merry Christmas! So wonderful of you to do! I have been following your blog for quite a while now and I love it! Merry Christmas! You have a wonderful heart! Love your blog. Merry Christmas! I already liked your Facebook page! Love surfing Sunday! I was just thinking about this post earlier today! Love y’all. Thanks for he giveaway! Love your blog and liked your fb page, too ? Good grief it’s been a long day ? 2016 has been a beastly beast. Wishing you guys a very merry end to it! Love your blog! It makes my day! Merry Christmas! Go Dodgers! ?? This is such a sweet thing that you do each year. Merry Christmas! I feel like you guys are close friends, I have been faithfully reading your stuff for years, we even share our birthday! Merry Christmas to you all! Sorry! My phone posted this on your message by mistake!! This is so kid of you to do each year. DITTO!!!! Me too!!!! Whoooo hoooo!!!!! And I didn’t know about the facebook page but LIKED it! Merry Christmas to you and your family as well! I’ve previously liked already your page. Merry Christmas and blessings for 2017! Feliz Navidad and a Happy 2017! And I just “liked” your FB page – bonus entry! I’ve liked your Facebook page previously ? Been reading for years. Love this blog. Been following you since my deployment back in 2010. Thank you for your honesty. I also liked your page ? Merry Christmas! You all are so great! MERRY CHRISTMAS TO YOUR BEAUTIFUL FAMILY!! This would be awesome! I’ll be honest, though, a lot of it would be spent on my students in my behavior intervention classroom. I liked your Facebook page as well! Love your blog! thanks for doing this and I hope you, Mike, Annie and James have a wonderful and safe holiday season! Happy Holidays! Your blog is the first thing I check in the morning. Thank you for all you do. Love your blog! My daughter, Delainey, was born on the same day as your Maddie, so I always hug her a little extra tight after reading your blog that week. Also, I already “like” your Facebook page! Thank you for alway putting a smile on my face this year! Thank you for filling each morning with your words, your pictures, your beautiful family and the amazing life you live, amidst the chaos, heartache, pain and suffering the world sometimes throws at you. Love and blessings to you and your family in the New Year!! Thank you again for the chance to win! Merry Christmas! Hi! Thanks for sharing your story. Thanks so much for the chance to win! Wishing you all the best and a Happy New Year! Thank you for this amazing giveaway and for sharing your beautiful family with us. Liked your FB page too. Merry Christmas to your sweet family!! Christmas blessings! Merry Christmas to the Spohr family. Wishing you and your lovely family a wonderful Christmas and a Happy 2017! How is it almost Christmas already?! Merry Christmas Spohr family! I love following your adventures and thanks for the reminder to look for the good things…it’s definitely been a rough year. I didn’t know there was a FB page…of course I just liked it! Happy Anniversary you two love birds!!! Merry Christmas!! 2016 has been rough, and I think we will all be happy to see the end of it! Yay for all this Christmas cheer! It has been a tough year for so many. I lost my beloved kitty Waffles and my beautiful momma. Thank you for doing something to make the world a little brighter. Merry Christmas! Wishing the best for us all. Merry Christmas!! Thank you for sharing your lives with us. Previously liked your FB page too! Love your blog! Thank you! Merry Christmas! I already “like” your Facebook page as well. Posting another comment to tell you how much I love your blog – it’s one of my go-tos every single morning. You guys are so generous! Also, like you on FB. Love this giveaway every year, even if I don’t win it’s so nice of you to do this!! I’ve liked your Facebook page for a while now ?? I like the Facebook page. So excited for the holidays! Your family (and especially Maddie) have made such a difference in my life, especially now that I am a mom. Merry Christmas! Thank you for continuing to share your story with us. 10 bucks says you bring us more joy than we bring you. Lots of love from Colorado!!! Another commenter said it’s your anniversary. I’ll believe them so Happy Anniversary! Merry Christmas Spohrs. I recognized Annie and James from the back on Mike’s Buzzfeed article about the Silo/Chip and Joanna Gaines. As soon as I saw them, I went to the front of the article to see if Mike was the author – and there he was. Just a tidbit to share. There are 666 comments. I am going to consider that lucky. Scary lucky. Thanks for sharing your lives with us! Merry Christmas! Phew! Lots of comments here! More importantly, though, Happy Anniversary! Would love to win a little extra for the holidays! Merry Christmas and Happy New Year from all the way in New Hampshire! Also like the Spohrs on facebook! I enjoy reading your blog. I especially enjoy the DIY’s. You have to do some more! Merry Christmas, Spohr Family!! May 2017 be the best yet!! I “liked” your FB page YEARS ago! Comment 1 of 5… if I did the math right and if I actually remember to comment every day. Thanks for doing this every year. Well, the weather outside looks frightful…. Merry Christmas to your family from Oregon! Happiest of holidays to you. This is such a sweet drawing you offer and if I should be fortunate to win, I’ll be sure to share something good that I do with it! Thank you! Blessed Christmas to the Spohrs family! You guys are awesome! Merry Christmas! By the way, I’ve liked your FB page. Thanks and Merry Christmas! Merry Christmas to you guys and hope 2017 is better for everyone. Popping in for my daily entry today. Love yout FB page and your blog! I love your tree tradition! Merry Christmas. I liked your Facebook page! Merry Christmas! Merry Christmas! Your family is a gift to all your readers! Have “liked” you on Facebook for years! “Sorry, illiterate space aliens!” made me giggle! Thanks, Spohrs! And I liked your fb page a while back! And also hoping 2017 is a better for you all, and the rest of the world as well! Thank you for sharing your family with us, Heather. I hope you all have a great Christmas together and a wonderful 2017. I have also liked your Facebook page for a long time – and shared it on more than a few occasions! more amusing Spohr family stories! Merry Christmas to you and your family!! Love your blog and I have been reading for many years. Thank you for the chance to win this amazing giveaway! Always love reading. Merry Christmas! Why do the children not seemed as excited about Christmas as I am? Only 8 days! Thank you for your generosity and this opportunity! Merry Christmas! If you’re not done shopping hope you’re having fun doing so this weekend! I have read your blog for years and it is one of the few I still read but rarely comment. Merry Christmas! I’ve been reading for years and appreciate how honest and kind you are in every post. Thanks for all you do! Thank you for sharing your family. Merry Christmas, you guys are awesome! And I already liked your FB page at some point in the past. Maybe last year when you ran this contest, haha! It’s hard to believe Christmas is one week away! Thanks for this opportunity. Loving Annie’s ballet slipper shoes she’s wearing in photo after her choir performance! So cute. Won’t be sad to see the end of 2016, here’s to a better next year for us all! ?? Merry Christmas and thanks for all of your good work. And I liked and continue to follow the Facebook page! Also, like you on Facebook. My post for the 17th. Merry Christmas! Hope 2017 brings you an abundance of joy! Well said about 2016. Your blog is one of my favorites! Liked your blog on fb! Happy to have something more positive in my newsfeed. Happy Sunday! Also, a slightly belated happy anniversary to you and Mike! Merry Christmas! Thanks for doing this! And thanks for continuing to write. You are fabulous! I have been reading your blog for about 8 years now. Thank you for including “us foreigners” in this giveaway. Merry Christmas all the way from sunny South Africa. I would love this. Merry Christmas. I’m excited to be sent to enter from the other side of the world ? Merry Christmas from summery New Zealand. 2017 is going to be fabulous, I can already feel it! Merry Christmas! I am finally getting over my cold! Happy Holidays, everyone! happy holidays to your beautiful family! Love the yellow submarine tea infused from today’s post. I love your surfing Sunday posts!!!! You guys are some of my favorite people on the interwebs. Here’s to 2017 not being a dumpster fire that 2016 was. I just finished grad school and could really use the gift card to get Christmas gifts for my family! Merry Christmas to your family!! Merry Christmas. I’ve enjoyed reading your blog over the 7 years and yes I’ve liked your FB page. Thanks for a chance to win. Thank you for your blog! It’s a daily read for me! Merry Christmas! How nice to have this whole week off- I actually scheduled dental appointments last week to take a day off work. Slightly desperate! Of course I’ve liked your FB page! Merriest of holidays to you! I’d love to win! So many things on my wish list! I’ve followed on Facebook for years! We did part of our Christmas with one side of the family today, and our kids were bonkers. Good times! (But I am glad to spread out the fun.) Thanks for this giveaway! Thank you for bring laughter and emotion to my life. You are great writers. Merry Christmas! Enjoy school being off! I am a kindergarten teacher. We work ALL week including all day Friday!!! This is so generous of you! Thanks! Wishing you and your family a very Merry Christmas this year! Happy Wrapping… the presents you bought and wrapping up this bummer of a year! Wishing you a very Merry Christmas and Happy New Year! Really enjoy your Surfing Sunday posts, can’t wait until they return in 2017! Happy holidays from Wisconsin! Happy Holidays to you and your beautiful family! I’ve been a fan for years! Hope you have a happy new year! I KNEW I wouldn’t remember to enter every day. Ugh! I will say what I say every year…Thank you! You Spohr’s make me very happy. I enjoy your vaccination passion, your love for people, your humor, your children and your gift of the gab! 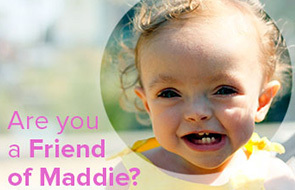 On the very off chance my name is selected, please donate the money you would have spent to Friends of Maddie. I want and need nothing. Just a world where we love and cherish each other. That starts with being generous. Thank you for always setting that example. Love your blog, I have been reading it for many years! Love that you do this every year! Have liked and “liked” your facebook page for quite some time. Wishing you and your sweet family all the simple pleasures of this time of year! Thanks for all the Christmas ideas! And I am already a follower of yours on Facebook! Merry Christmas to all and to all a good newt! Have a wonderful christmas, Spohr family! Happy holidays!!! I hope you and your family have a wonderful Christmas! Merry Christmas and happy 2017. Can’t believe the holidays are so close! Merry Christmas! Can’t believe it’s less than a week away! Monday before Christmas = tough times. Gotta get through this week! Sending love to the Spohr family this holiday season! Thank you for blogging! May your days be Merry and Bright!! Much love to your family and Merry Christmas! I can think of lots of fun uses for this gift card! I liked the Facebook page too! Merry Christmas, you guys. Here’s to a new and better year in 2017! Hope you have a great week relaxing!! Thanks for your posts! Love hearing about your family! Merry Christmas! Thanks again for doing this! A very Merry Christmas to you all!!!! I always look forward to your surfing Sunday’s – thanks for the roundup every week! Merry Christmas and thanks for the blog. Hope you and your kids are enjoying winter break this week. I also like you on Facebook. I also like you on Facebook! Good morning Spohr family! Merry Christmas. Have a great week off with the whole family! Love, love the blog. And thank you for the robot toy tip! Purchased for my nephew. batteries as stocking stuffers – what a great idea! Note to self – don’t forget the batteries! Great idea on the batteries! Thank you for doing this again this year! And I’ve always liked your facebook page! I’ve already liked your Facebook page! Merry Christmas Spohrs! Love reading your blog!! Thank you!! You always provide enjoyment and entertainment and you are one of my favorite daily reads! Thank you so much for being so generous! Hello Spohrs! Thanks for all the great posts and photos this year! 6 days and counting! Merry Christmas!! Thank you for sharing your love. Merry Christmas Heather and family! I have previously liked your Facebook page. Merry Christmas, oh another foolproof stocking stuffer idea: Silly Putty!! Lottery Tickets are my favorite Stocking Stuffer. Have a great week together!!! I have previously liked your Facebook page! Hey Heather, we have a lot in common, though you wouldn’t know it because, well, I read your blog, and don’t write on the internet But, just the same, thanks for sharing your lives, your ups & your downs. I miss my girl too. Hope all you cuties have a great Christmas. Hope you all have a Merry Christmas! I love watching your kids grow…can’t believe Annie is almost 7!! Here’s hoping! Happy Holidays Spohrs! Happy Holidays to your family! Merry Christmas, happy holidays, happy New year :). Hope this first day of your holiday week was nice! Thank you for this opportunity. Thank you for being so kind to your readers! Wishing you a very merry Christmas and all the best for a very happy and healthy New Year! Thank you for doing this! Love the blog!! Thank you again for the opportunity to win! Man, would this be a huge help to my family and I this year. It’s been a rough 5 months and this would be more than a blessing. Merry Christmas and thanks for doing this for your readers! Merry Christmas! I love how your picture has hearts bouncing off the tree. I have enjoyed reading your blog over the last many years! I love reading your blog. You always have great posts. I didn’t even know you had a facebook page, but I liked you on there! Merry Christmas! Happy holidays! Thank you for the opportunity to win! Last entry! I think, it’s already Tuesday evening here, the time zones are confusing. Thanks for the chance to win this awesome Christmas giveaway! Hoping to win, love your blog by the way. Last chance! Thank you so much. Only four more days! I am so excited for this Christmas. It is only or second one at home as we usually travel to family. The first time I had a newborn and totally slacked off. I am so excited to keep it relaxing and simple this year! Hope you’re enjoying your extra family time this week! Hope your enjoying your week off! Merry Christmas! Merry Christmas! Would be nice to win but good luck to all. Whoohoo! Christmas is almost here. Merry Christmas you guys! Hope the joy you give is returned tenfold! My final entry! Thanks for the opportunity! I hope that you and your family have a wonderful new year!! Once again, thank you for your generosity! Wishing your family a very Merry Christmas and a Happy New Year! Merry Christmas to your generous family! Thanks for doing this every year! I love reading your blog all year long, and this is just so nice and generous of you guys! Merry Christmas to the entire Spohr family! Best wishes for a wonderful holiday season and new year to the Spohr family and everyone reading this blog!!! Merry Christmas to you and your beautiful family!!! Thank you for being so kind!! It’s only 3:00 EST and I’m hungry for dinner. Distracting myself with your blog has helped a little! Thanks for the opportunity. I also like your Facebook page. I hope you have a wonderful Christmas and are enjoying the winter break. Wow–Christmas is in five days? How did that happen? Best wishes to you all. I love reading here. And this is so generous of you guys! One last Merry Christmas and Happy New Year! Good luck and have a great Monday. One last Merry Christmas, just before the cutoff! You are a continued inspiration to me. Merry Christmas to all! Do all expenses happen right when we spend lots of money on the holidays? I have a cat with a sudden medical issue and the children’s bunk bed is busted.